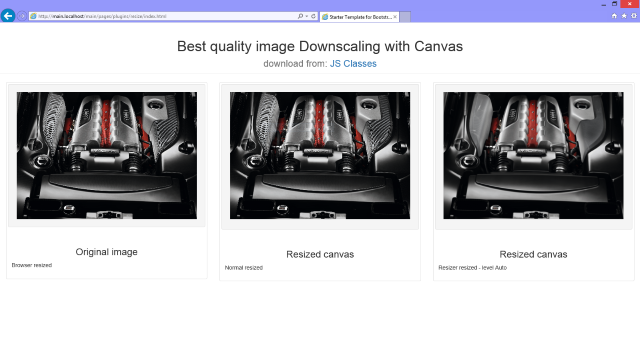 This object can rescale images smoothly using HTML canvas objects. It can take an image given the image object or a selector string of the image element to rescale. The object can create a canvas to render the image rescaled to a given ratio or to a given size optionally preserving the original image proportions. The image can be rescaled smoothly if the browser supports the imageSmoothingEnabled property. The smoothing level is configurable. The object calls a given callback function when the rescaling is done passing the canvas object that contains the rescaled image. Prize: One downloadable e-book of choice by O'Reilly One way to rescale images on a browser is to use canvas objects and create copies of the original images at different sites. Modern browsers support a property named imageSmoothingEnabled that can be used to create smooth versions of rescaled images. That property may have a slightly different name depending on the browser type. This object can create smooth rescaled images on several different browsers that support that feature.